Bali makes for a dreamy honeymoon – a seamless blend of welcoming culture, intriguing architecture, incredible white-sand beaches and stunning natural beauty, it’s a destination synonymous with tranquility and pleasure. On your first journey together as newlyweds embark on a voyage of discovery exploring culturally-rich Bali, enjoying sun, sand and surf; mesmerising sunsets; and jungle-clad vistas. Stay in luxury resorts and private villas – a time to revel in your own slice of paradise. Your enchanting Bali honeymoon offers the escape of a lifetime - serene retreats boasting sublime facilities, first-class service and striking scenery. Upon arrival at Bali’s International Airport (Denpasar), meet your driver outside and depart for Ubud, located in the heart of Bali. Ubud is Bali’s artistic and cultural centre and offers an amazing range of activities and beautiful scenery; a perfect place to start your honeymoon! Upon arrival, check into your hotel and take your time settling into your new environment where you will spend a blissful 4 nights. Start your first morning as newlyweds in Bali with a romantic in-villa, gourmet made- to- order breakfast with your choice of premium champagne. In the afternoon embark on a private tour of Ubud highlights include Tegenungan Waterfall; where although only about four feet tall, water flow is very heavy. Natural scenery around Tegenungan Waterfall is quite beautiful, with lush trees. You can eat and drink at the simple stalls while enjoying the beauty of Tegenungan Waterfall from a distance. Also experience the artistic villages, Tohpati Village and CELUK Village; the former is famous for its Batik and the latter for gold and silver custom crafting. This tour will also take you to the sacred Monkey Forest, the Ubud Palace, Ubud Market and to witness traditional Balinese dance portraying Balinese mythology and history. The day is pent at your leisure. 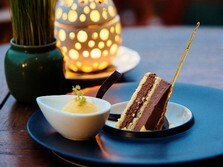 Take advantage of a Balinese cooking class or refreshing spa treatment at your romantic villa resort. This evening, enjoy a romantic dinner under the stars. Start with a tantilizing Mango Mimosa cocktail then enjoy our chef’s specially crafted romantic candlelit gourmet menu on your own water Bale. The water Bale floats on our swimming pool and is decorated with beautiful, colourful drapes to give you a mesmerizing and delicious evening under the stars. You are surrounded by suspended frangipani candles with inspiring views of the local ancient holy temple whilst listening to the smooth rhythmic jungle sounds. The day is pent at your leisure. Take advantage of a Balinese cooking class or refreshing spa treatment at your romantic villa resort. Dine at a spiritual and ancient holy Dalem Segara Temple. Your own personal butler will serve an exclusive and private BBQ gourmet dinner prepared by our Balinese Chef. Your journey begins from your villa, where you will be led down a candlelit path through the jungle, over our beautiful Monet styled bridge and the fast flowing Ayung River and up to our romantic hidden temple. On arrival, you will be given a traditional Balinese welcome by the holy Mangku (the Balinese religious priest) who will give you a blessing and a Hindu purification ritual to cleanse your soul. Two of our trained spa therapists will then give a relaxing reflexology foot massage and your butler will serve you cocktails and canapés. The ultimate romantic and magical decadence. Depart for an amazing drive through rural Bali to Amed, on the eastern tip of Bali. The trip is cool and breezy and allows you to connect more closely with the local environment as you pass through several traditional villages. Arrive at Kintamani, which is located about 1,700 metres above sea level and enjoy the fresh tropical air and stunning views of the surrounding volcano peaks and lakes. 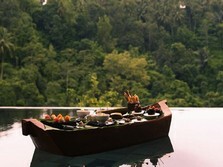 Lunch is served upon arrival after which you continue your excursion with a visit to Lake Batur. The lake is Bali’s largest crater lake and provides water for an underground network of streams and hot springs. Board a local rustic boat and enjoy a short trip across the lake to absorb the magnificent scenery. Get back into your vehicle again and drive towards Amed, a small fishing town on the eastern shores of Bali. Arrive at the hotel and enjoy free time to settle into your new surroundings. Enjoy an entire day at leisure in the surroundings of Amed. Famed for its beaches lined with outrigger fishing boats, Amed offers a haven of rest for those wanting to escape the crowds. Diving and snorkelling are among Amed’s most popular activities.The empty beaches of Amed are great for quiet sunbathing or you might like to simply enjoy the pool and facilities of your hotel. Leave Amed after breakfast and drive through amazing scenery towards Candidasa. On the way, visit the picturesque surroundings of Tirta Gangga and its most distinctive feature – the Water Palace, which was built in 1946 by the King of Karangasam.The maze of pools and fountains are surrounded by a lush garden filled with stone carvings and statues. Continue with a visit to Pura Lempuyang Luhur, one of Bali’s nine directional temples and of great significance to the area. Observe on the way the magnificent scenery for which the area is famed and admire the terraced paddy fields that distinguish the landscape. Continue to Candidasa, a quiet sea-side retreat town that offers a haven of tranquillity. Arrive in time for lunch and enjoy an afternoon free at the beach or hotel pool. In the afternoon head to Pasir Putuh near Amlapura, Bali’s finest white sand beach. Depart Candidasa and head north towards Besakih temple, Bali’s largest temple and often referred to as the “Mother Temple”. The temple is located at the foot of Bali’s highest volcano, Mount Agung. Visit the temple and receive a blessing from a local Hindu priest. The blessings are meant to protect from illnesses and other bad spirits and aim to bring prosperity, longevity and happiness to people. 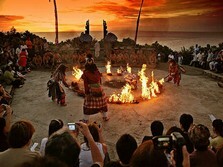 From Besakih you transfer at once to Uluwatu, Bali’s new luxury destination. 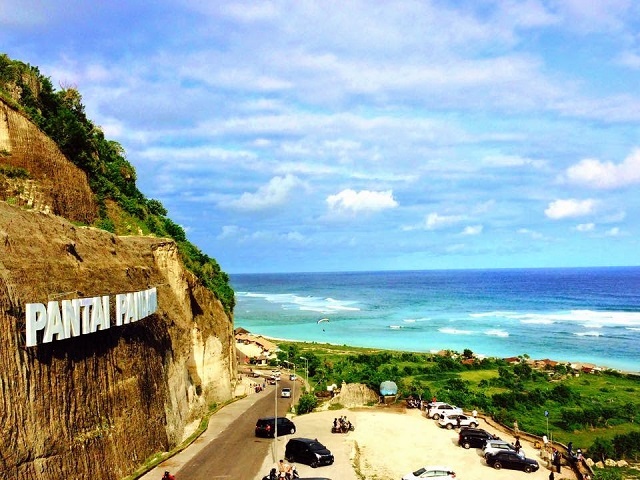 The Uluwatu cliffs tower 80 metres from the sea and offer majestic sunset views. Upon arrival, check into your hotel and enjoy free time in the afternoon before you transfer in the late afternoon for Pura Luhur Uluwatu, a striking temple perched on the cliffs. Admire the romantic sunset from the cliff and transfer to Jimbaran for a dreamy seafood dinner on the beach. Lighted by candles and served by a private butler, enjoy the fruits of the sea in peace. Enjoy an entire day at leisure in the beautiful surroundings of Uluwatu, which is located on the southernmost tip of Bali on a peninsula called Nusa Dua. Literally meaning “second Island” Nusa Dua is a luxury retreat with perfect beaches and rugged scenery. Take your time in the morning to collect all your belongings and transfer to the airport for your flight back home.